As you all know from reading my posts, I'm a bullet journal addict. I absolutely adore my bullet journal and it has helped me get through some of the worst days of the last few months. It's my hobby now, I guess. 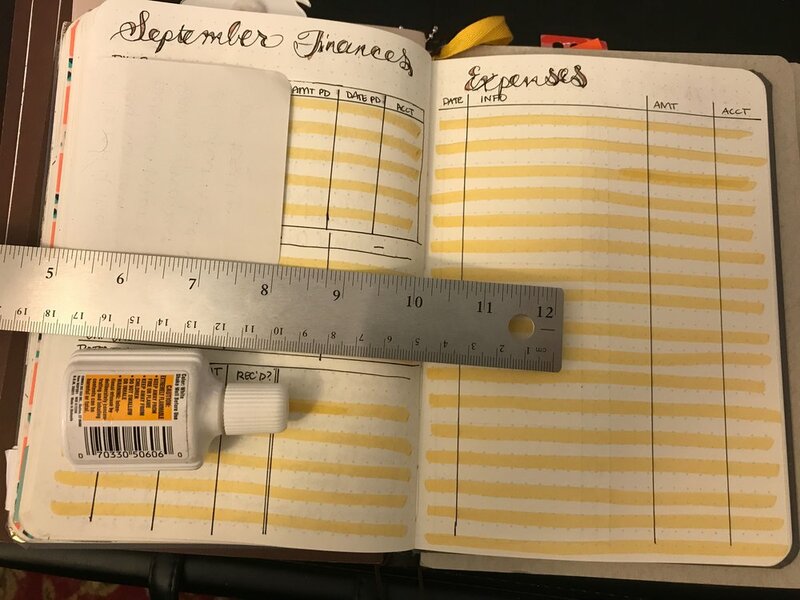 Anyways, I know that I STILL owe you a post explaining how I use a bullet journal, but in the meantime, I wanted to share my September Set Up with you. This was my first time playing with a water brush with my tombow markers. I'm not absolutely in love with the look, but I really enjoyed the process. Each month, I have a cover page with the month name and some goals for the month. This month, my goals were largely based on my 18 Things to do Before 2018 (post to be written). I enjoy making each month a little different. In the past, I've done wreaths, arrows, and geometric shapes. The month at a glance page tells me everything I need to do for the month. This one isn't complete, but it gives you an idea of what my monthly page looks like. Each month, I have a tracker where I track the habits I want to work on and the chores I need to make sure do. Here's mine for September. I've added a lot of items this month because the semester has begun and I desperately need to be productive. 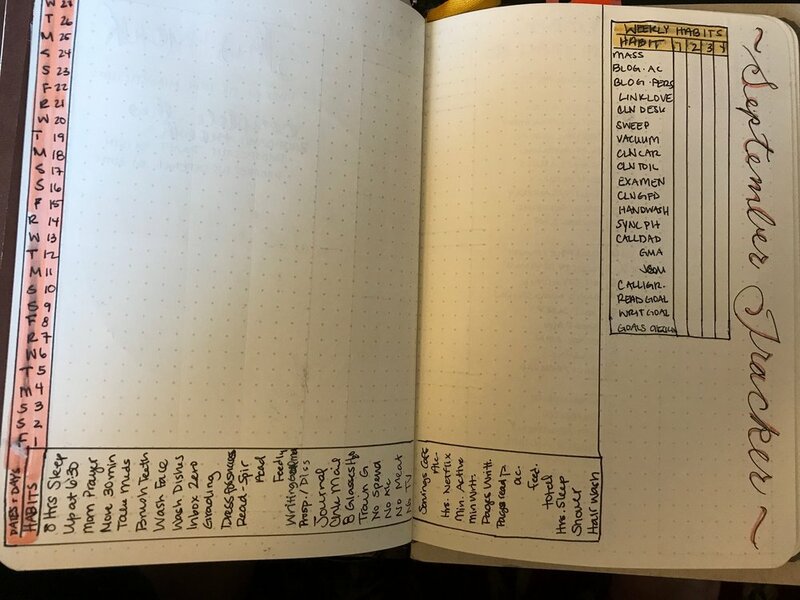 What goals do you put in your habit tracker? The health tracker for this month is much more intense than what I usually do, but after a few really bad scares last month, I knew I needed to monitor myself better to be able to describe what was happening to the doctor. What symptoms do you track? 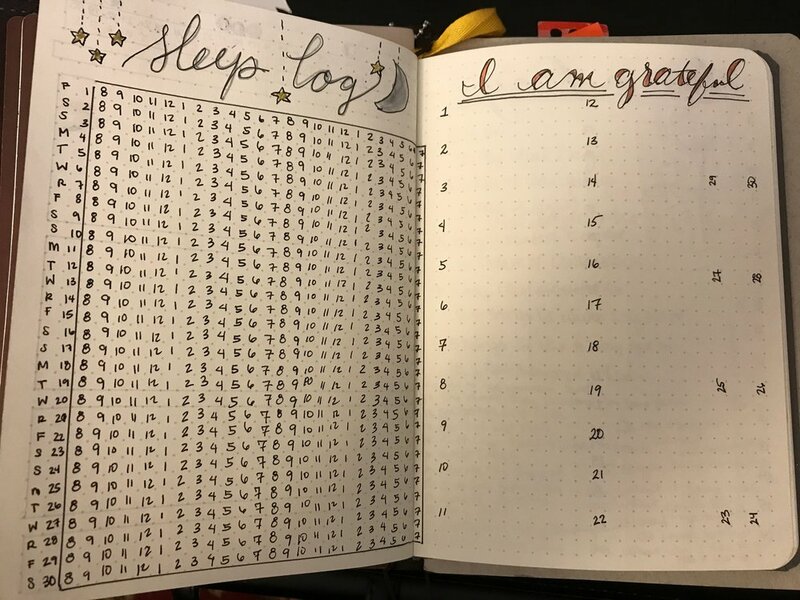 This sleep log page is based off the one that Kara from Boho Berry included in her August journal. I have been having a hard time getting enough sleep, so I always track my sleep. My gratitude journal is an important part of my mental health care. I write down anything from "snuggles with Gary" to my friends' names to "I woke up this morning." It's good to keep things in perspective. I have to admit that I'm not even remotely happy with my "Boho Berry Challenge" page, but my printer is out of ink and I got impatient and wrote it in instead of waiting to print it at work. The line a day page is new for me this month, but I'm hoping it will help me keep track of what happens in my life. One thing that I'm really working on right now is getting better at keeping track of money and budgeting. Using my bullet journal helps me remember to pay bills and keep track of debt that needs to be paid. Each week, I have a page with an ongoing to do list and a schedule then daily sections (usually 3/page) with my to do list for that day as well as the weather predictions. All in all, this set up has helped me stay organized better than anything else I've ever tried. How do you stay organized? Would you be interested in a bullet journal?